One question I see occasionally is people asking how to go about using prebuilt cell factories (such as those provided in the DataFX project run by Johan Vos and I, those sitting in the OpenJFX 2.2 repo in the javafx.scene.control.cell package, or just those that they have created internally), and also show a context menu when the user right clicks. More generally, the problem is that cell factories are blackboxes, and there is no support for chaining cell factories together (or even getting hold of the cells as they are being used). Before I get any further, I should note quickly that this blog post is about ListView / ListCell, but the exact same approach (and even code – barring a little bit of renaming) is still totally applicable to TreeView and TableView. * A fully fleshed out class that allows for context menus to be shown on right click. And that’s that! :-). Hopefully this is helpful to people out there. I’m sure you’ll have questions and comments – feel free to leave them on this post so that others may also learn. in the first example, why do you check if cellFactory is null? In the ContextMenuListCell class, is the constructor used for anything? 1) I check if the cellFactory is null just because I want to return a non-null cell, and if the cellFactory is null I need to create a DefaultListCell instead. 2) It is not used in any of the code above, but if someone wants to create their own cell factory, they can then return an instance of the ContextMenuListCell if they want (but there is very little value in doing so as any cell can have setContextMenu(..) called on it). In my TreeView, I set a ContextMenu in my updateItem method, because I have two different types in my TreeView and I need to set a different context menu, depending on the type. I assume this is correct application. 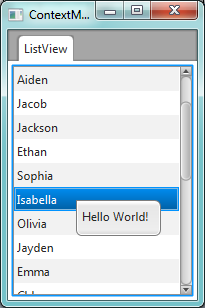 Each context menu uses binding to bind its MenuItems textProperty to some “global” variable, lets say one in my CellFactory. Do I need to unbind those properties, before setting the context menu to null? Otherwise I suspect that the old context menu is still bound, but there is no reference anymore, thus causing a memory leak!? The same problem/question also can be applied to the graphic. I think before setting the graphic to null, it should be unbound. Many thanks for this detailed post, Jonathan. I’ve been out of circulation for a time and I did not see it until today. I’ll digest it and perhaps have further comments. I’m pretty new to both Java and Javafx, but I just wonder if it is efficient (performance-wise) to have a context menu object for each cell? and initialize it with null. As i am a new in java and JavaFX so can you please explain me what is customCellFactory here and for what purpose you use it. Also tell me that how to create it and initiate it. thanks for your great post. i have a problem using cell factories and that is the list view is filled with images but the only thing that it shows is a memory address.